n 2009, entering with Hurtigruten.no we were amazed by the scenery, this time we can explore the place over a couple of days instead of hastily taking some photos before getting on a bus. 1. Another crossing ferry between Molde and Vestnes. 3. 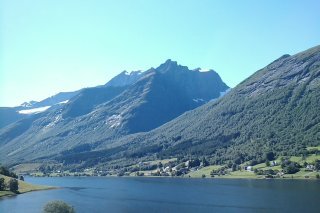 View from our tent at Geiranger camping. Drying our socks, soles and shoes in the sun on deck while protecting them from tourists passing from one side of the deck to the other taking photos as the speakers announce the various things to notice as we travel through the Geiranger-fjord. Pitch tent at Geiranger camping, next to everything else in this small place, then plan the next day, browse shops for another sweater, enjoy the sun and view, make food on our beloved wisperlite but in shadow as the tall mountains here hides the sun way too early, and finally sleep!